Right. Ok. Back to the topic at hand. 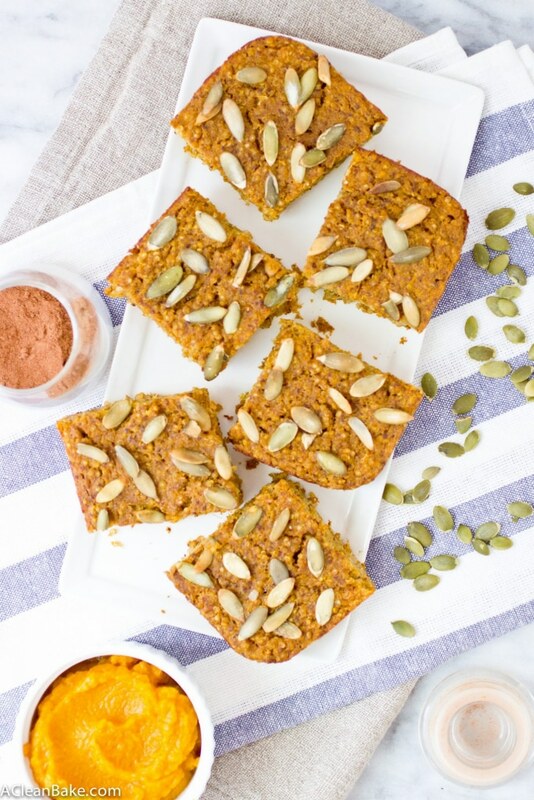 Now that Starbucks says that this is a socially acceptable time of the year to re-introduce pumpkin to our diets, I think that is also a great cue to shake up the ol’ breakfast routine. Because I don’t know about you, but I could really use a break from my two-egg morning routine. 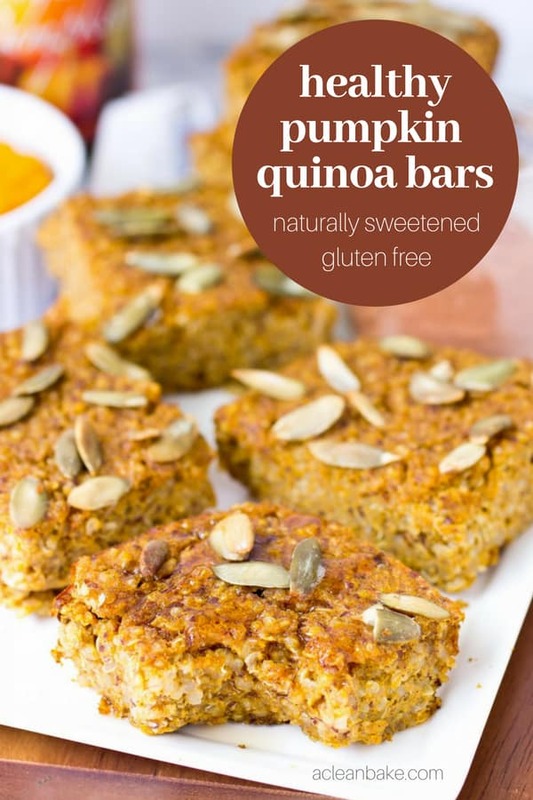 Baked quinoa bars aren’t really as odd as it sounds when everyone and their mother is all about the baked oatmeal (including me), and this is really just a grain-free alternative. That said, since you are using cooked quinoa instead of dry, as you would with oats (which don’t break your teeth in their uncooked state, like quinoa is prone to), these are more moist and therefore slightly less sturdy than their oatmeal counterparts. While they do hold up just fine to things like a morning commute, and being eaten with one hand while standing over a dresser applying makeup with the other hands (in case you were curious), don’t expect them to be sturdy, like a granola bar would be. If you want a granola bar, bake this, this, this or this in a pan instead. But they do stand up well enough for a busy morning. 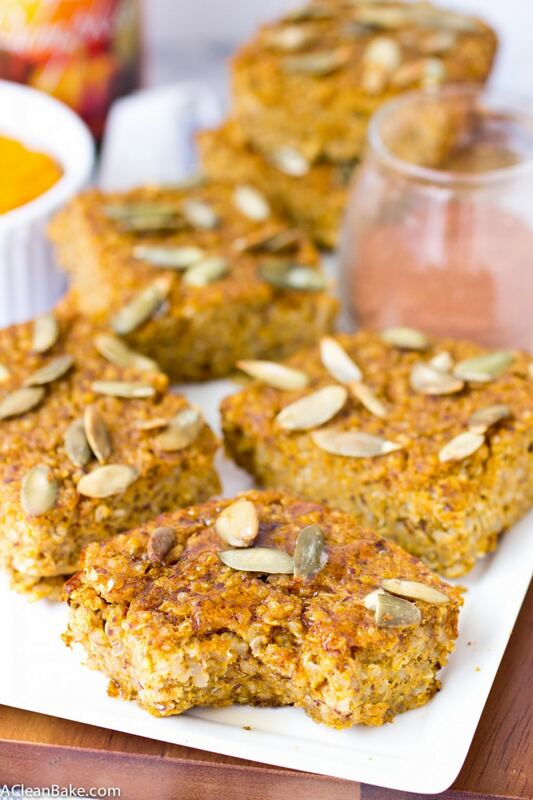 These bars are ridiculously easy to make vegan, simply by eliminating the chicken egg and adding an additional Tablespoon of flax meal. As far as substitutions, you can use any kind of squash (except maybe spaghetti); I have found in the past that butternut puree stands in for pumpkin very well from a texture and moisture standpoint, but it gives the dish a little bit more “vegetable-ish” flavor, so you may want to increase the maple syrup to compensate. Acorn is also an excellent replacement because it has a similar sweetness. Oh, and of course, feel free to replace the pepitas with whatever you have around. Pecans would be an excellent alternative, as would walnuts, or…well chocolate chips never hurt anyone either. Oh, and if you warm them up and they taste like square breakfast porridge. Break out the pumpkin, everyone, it’s time for breakfast! Preheat the oven to 350F. Coat an 7x11" baking pan with nonstick spray and set aside. In a large mixing bowl, combine the quinoa, spice, flour, salt and flax meal. In a small mixing bowl, stir together pumpkin, maple syrup and egg until combined. Stir pumpkin mixture into quinoa mixture and allow to sit for about 5 minutes, which allows the flax to start to absorb some of the liquid. Pour the batter into the prepared pan and spread into an even layer. Sprinkle pepitas evenly across the top. Bake for 40-50 minutes or until the top is golden and set. Serve with a drizzle of maple syrup on top. Make sure you are using pumpkin puree, which is cooked and mashed pumpkin, instead of pumpkin pie filling, which is pumpkin puree mixed with lots of sugar and artificial flavors. There are lots of add-in possibilities, if you want. Try more pepitas, dried cherries, chopped toasted pecans or walnuts, or chocolate or cinnamon chips. To make this completely sugar free: omit the maple syrup and add an additional 1/2 - 1 tablespoon granulated stevia or monk fruit, to taste. Reduce baking time by 5-10 minutes. You may omit the stevia entirely if you want this to be completely unsweetened, but I wouldn't recommend it. If you do omit all sweeteners, double the vanilla and add additional pumpkin pie spice (to taste). Store in an airtight container in the fridge for up to 5 days, or in the freezer for up to 3 months. So your vegan comment – do I replace each egg with flax seed, or with a flax seed egg (flax + water)? You’ll have to replace each egg with a flax egg (flax + water) and then make sure you are also adding the flax that the recipe calls for on top of it. 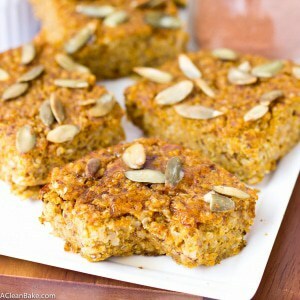 In order words, the flax eggs don’t replace the flax in the recipe.